Note: You can explore this website on your own tablet or laptop at http://www.tinyurl/vpmla14. Welcome to the latest prototype of my ongoing digital humanities project, Visible Prices (VP). This demo was created for display at MLA 2014, as part of the DH From the Ground Up panel; and focuses on one 10-year period in the 19th century, 1845-54. I chose this span because I indexed prices in Charles Dickens' novel The Personal History of David Copperfield, which was published during 1849 and 1850. While eventually, VP will be much larger; this is a small prototype, designed for experimenting with Scalar. You can navigate it using the path below, which is also available via the left-hand column. I've been working on VP since 2009. I had noticed that references to specific prices for specific incomes, goods, services, and experiences appeared regularly in a variety of genres; and also, that these prices were all but invisible in the texts, and difficult for my students to understand. My original question involved Charlotte Bronte's Jane Eyre. In the novel, Jane is offered £30 per annum as governess. But what does £30 mean for Jane? Is it a generous salary, or an impecunious one? What would we understand about Charlotte Bronte's novel if we knew what £30 would buy? 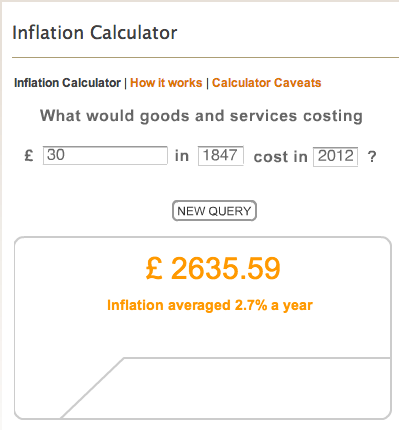 Though inflation calculators exist, like this one, created by the Bank of England, and based on the Consumer Price Index, such calculators communicate something that most users already know: that the value of money changes over time; and that enough money to live on in 1847 would be insufficient to live on in the 21st century. This introduction is the start of a path that will take you through a subset of the full collection, which I used to test out Scalar, to see whether it would work as a platform. I've also included a statement on the technical side of building VP and on the next steps I'll be taking as the project continues.